The ageing artist is sitting there. Motionless. Behind him is a wall, covered in ivy, to his right a carved relief on an easel. The sun is shining and not a wind is stirring. Only the artist's hand, forming the corno sign, betrays his unease. 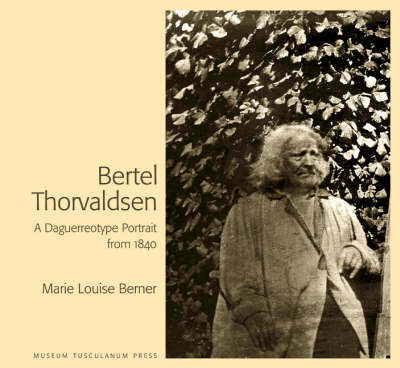 The picture portrays the sculptor Bertel Thorvaldsen in his late years, immortalized by means of the earliest photographical technique, the daguerreotype, named after its inventor, the Frenchman Louis Daguerre. This photographic portrait, the oldest in Scandinavia, has been a continuous source of fascination and bewilderment ever since its first public showing in Stockholm in 1894. Where was it taken, when and by whom? Over the years, suggestions and arguments have been numerous without yielding conclusive answers to these questions. By means of a thorough analysis of the picture and the photographic technique behind it, compared to the circumstances around its taking, these questions may now be answered, placing the picture as an interesting contribution to our understanding of early photographical portraiture. Foreword; The first Scandinavian photographic portrait; Studies of the portrait; Neubourg and the daguerreotype; Arguments in favour of the late dating; Portrait photography in France; Neubourgs three daguerreotypes from Copenhagen; The camera; Thorvaldsen in Denmark; Portraits of Thorvaldsen; The corno; Concluding remarks; Appendix. Jens Frederiksen: On A.C.T. Neubourgs camera, lens and daguerreotypes; Catalogue of A.C.T. Neubourgs daguerreotypes.